I made these for a Cinco de Mayo dinner party. They are very tasty, but you have to like lime flavor. 3. In a glass or small bowl, mix together the margarita mix and tequila. Make sure both are at room temperature to ensure smooth mixing with the rest of the ingredients. 4. In medium bowl (preferably with a pouring spout) whisk together the margarita mixture, 3 egg whites (also at room temperature for the same reason) and vegetable oil. 5. In large bowl or standing mixer, place the white cake mix and lime zest. Slowly incorporate the wet ingredients either with a hand mixer or standing mixer. 6. Beat mixture about 2-3 minutes. The batter will have a thick, tacky consistency. 7. Distribute the mixture evenly among the 24 cupcakes. Use a muffin scoop do so as pouring this thick batter might be a challenge. 8. Bake the cupcakes for 8 minutes, then rotate the pans to ensure even baking. 9. Bake at 350 an additional 8-10 minutes. Bake times can vary. They're done when you can pull out a clean toothpick from the center of a cupcake. To avoid over-baking, watch them carefully. 10. Remove from oven. Let sit in the tins for 5 minutes, then transfer to a cooling rack. 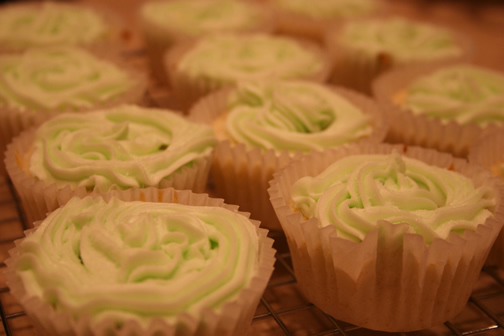 Once completely cooled (1-2 hrs), ice with Lime Buttercream Frosting (see below). 1. Using a stand mixer or a hand mixer, cream the two sticks of butter together. 2. Add fresh lime juice. 3. Slowly incorporate the sifted confectioner's sugar. 4. Mix until the icing is smooth. 5. Add green food coloring to your liking until you achieve a "lime" hue. 6. Ice the cupcakes using a star tip or plain, old butter knife. 7. Sprinkle granulated sugar on top of freshly iced cupcakes for a "salted rim" look. The sugar will also give them a nice sparkle. Just wondering, is the margarita mix alcoholic? Is it what you buy in a bottle? The mix is the non-alcoholic stuff you get in a bottle. it says 1/4 tequila, is that 1/4 of the bottle, or of a CUP? Jennifer, it's a 1/4 cup. :) Thanks for catching that. Yumm, these sound just delicious! !